Kamiya Bar in Asakusa, opened in 1880, is one of Tokyo’s classic bars. Known for its signature cocktail, Denki Bran, made from brandy, gin, wine, curacao, and herbs. At 270 JPY per drink, it’s cheaper than coffee. 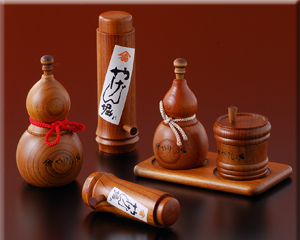 Bottles of pre-mixed Denki Bran are popular omiyage (local gifts) that tourists can bring back home to share with their friends, is sold at a retail window on street. The bar menu includes classic Japanese small plates like pickles, sashimi, and grilled skewers. In the winter months kaki furai, deep-fried oysters, is popular. Nikomi, offal simmered in Shinshu miso, is a signature dish and a classic shitamachi dish. Shitamachi refers to older parts of Tokyo. The clientele is made up of a mix of locals and tourists. The second and third floors are restaurants, but it is the first floor bar where you want to go. I wouldn’t make a special trip across town, but Asakusa is a popular area for the historic temple, Sensoji. 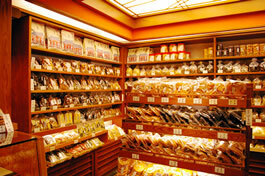 It is also walking distance to Kappabashi, a must-visit spot for kitchenware, tableware, and to see plastic food samples. If you find yourself in the area and need a break, stop by for a Denki Bran and a few bites. 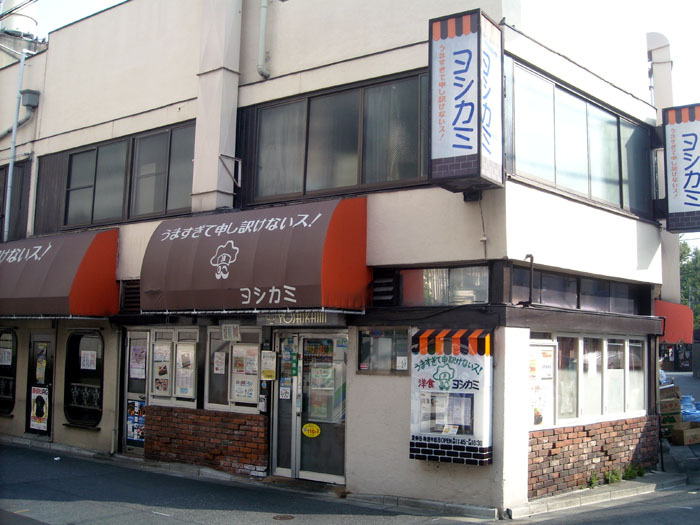 Kamiya Bar usually closes on Tuesday, but also on other days of the week, so do check the calendar on the bar’s website. 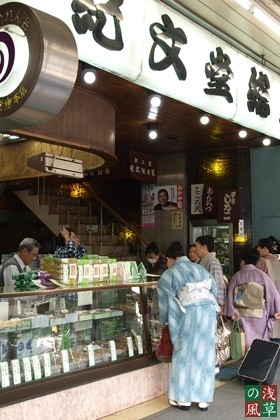 Otafuku in Asakusa has been serving oden for almost 100 years. It’s a great little spot for fishcakes stewed in a delicate seafood broth as well as seafood and other izakaya fare. I came recently with my friend, the food writer and reporter, Steve Dolinsky. Steve is originally from Minnesota and now lives in Chicago with his beautiful family. Steve was in Tokyo and we met in Kappabashi and did the short walk to Otafuku for dinner and an interview for his new show, The Feed Podcast, with chef Rick Bayless. 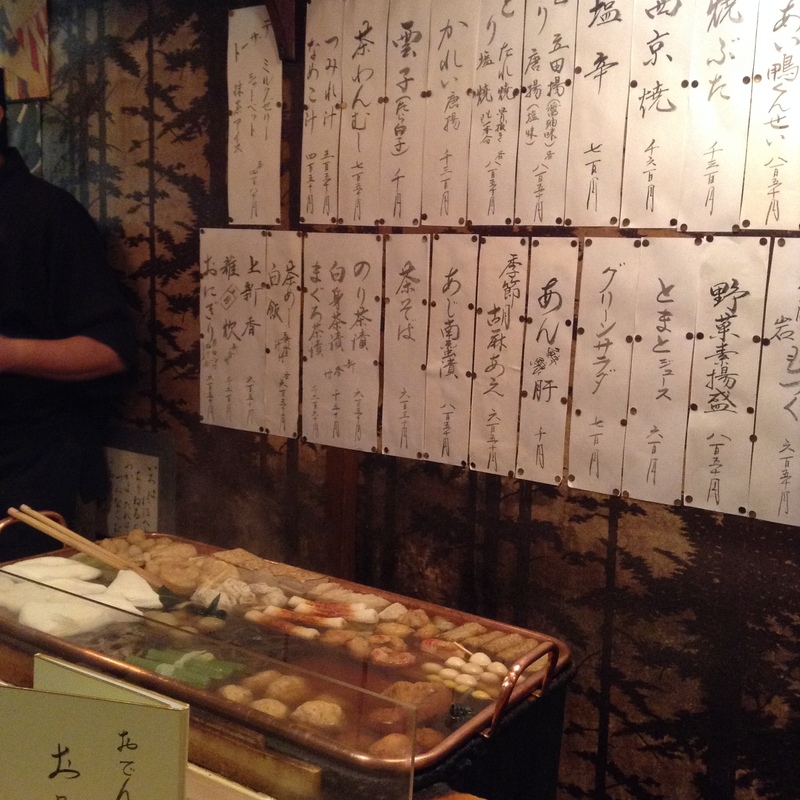 The menu at Otafuku is written in this beautiful Japanese calligraphy on the wall. But, we picked what we waned by just looking into the large, steaming bath behind the counter. Our first order was zenmai (reminiscent of ferns), shimeji mushrooms, atsu-agé (thick, deep-fried) tofu, and deep-fried Satsuma-agé fish cakes. Followed by fukubukuro (deep-fried tofu packets stuffed with mochi), kombu (kelp), and cabbage stuffed with ground meat. Note the awesome chopstick rest, also called otafuku. 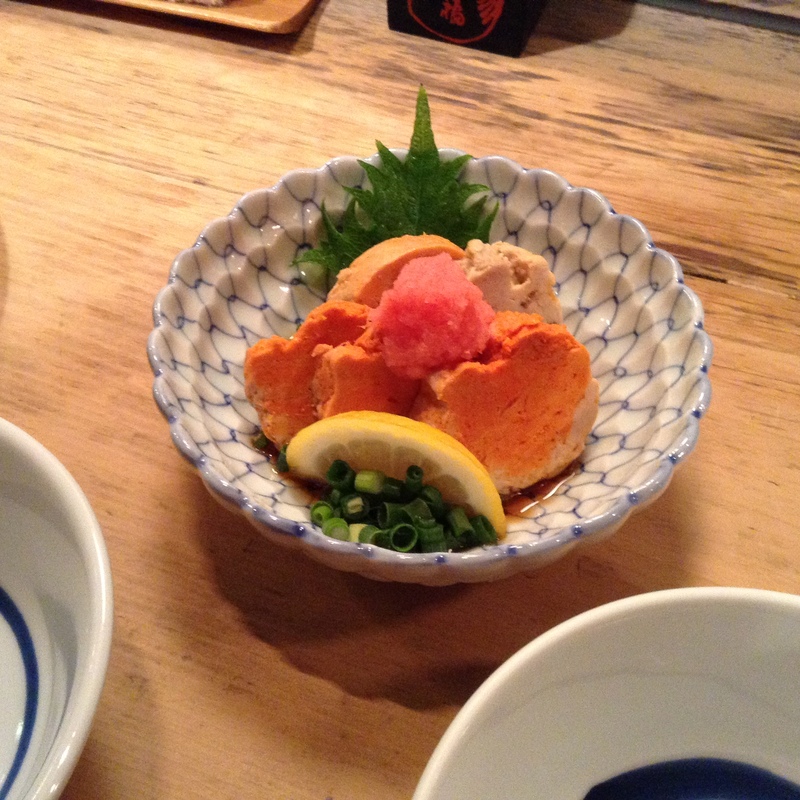 A meal in winter would not be complete without ankimo, monkfish liver, often called foie gras of the sea. The hand-written menu at our counter seats. Gorgeous calligraphy. 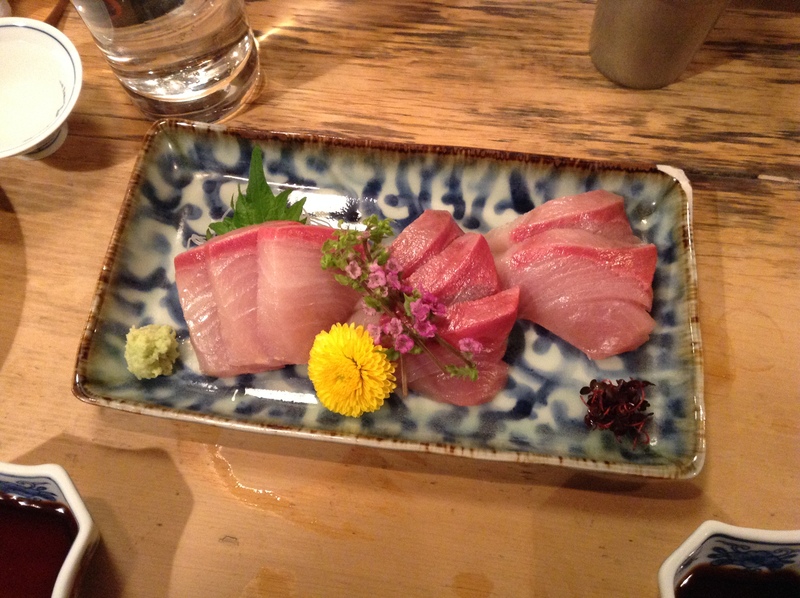 Sashimi of kanburi (winter yellowtail). So tender it melts in your mouth. My husband loves this fish so much we went to the most famous port in Himi, Toyama, on our honeymoon to eat this. Good stuff. And, the collar of kanburi, salted and grilled. Garnished with pickled ginger and freshly grated daikon with soy sauce. 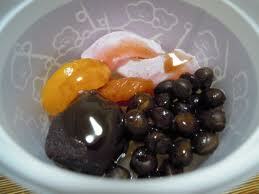 While most people associate oden with winter, this food is good all-year long. This night most of the customers seemed to be businessmen, although there was one young couple at the counter with us. Lots of groups coming in and there is table seating in the back, but it is most fun to sit at the counter and watch the chef manage the stewing pot. 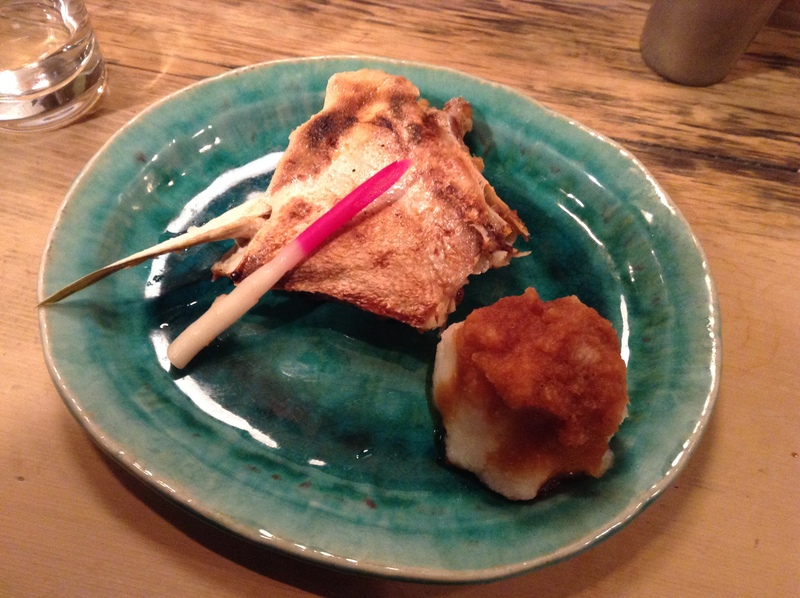 We make oden at home in the winter a few times a year, but we never make the variety of ingredients served at Otafuku. 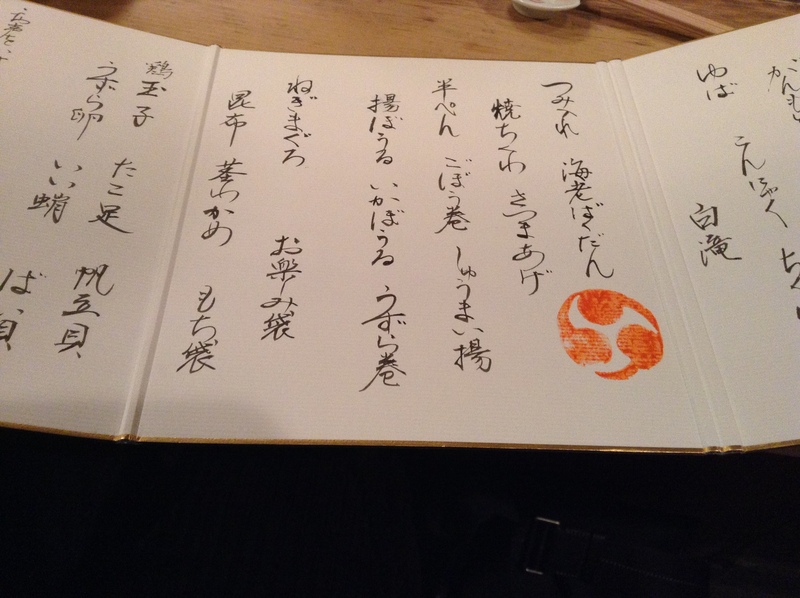 We had beer and a warm sake, both which went well with the menu. 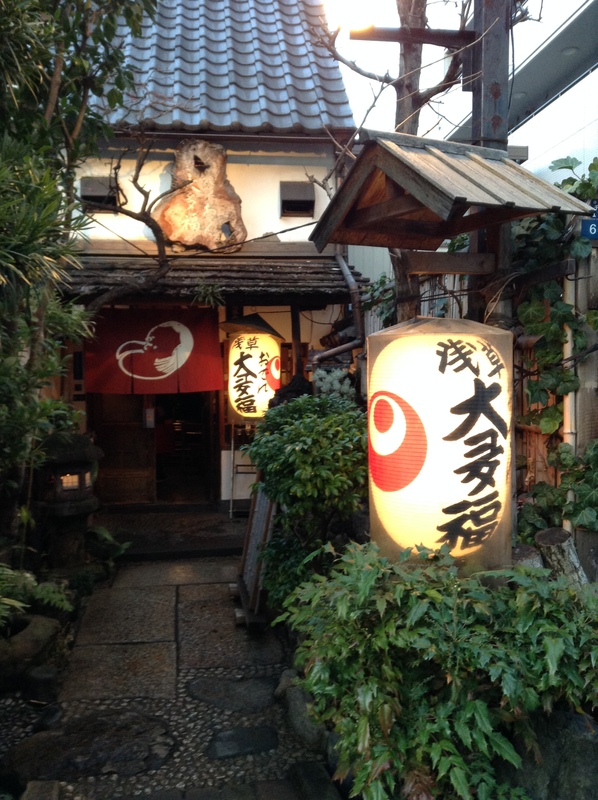 It’s a jovial restaurant filled with locals and one of the most famous restaurants in Tokyo serving oden. Some of my other favorites in Asakusa in this Metropolis piece. I often am asked for restaurant suggestions in Tokyo. Wow. Where does one begin? The food is amazing, from the high end kaiseki restaurants and sushi counters to the neighborhood ramen shop or izakaya. Even on a budget it is very easy to eat well in Tokyo. Let me put here just some of my recommendations of restaurants based on the types of food one should try when visiting. Also, one should consider location as the city is so big and there are so many great restaurants, it may not be necessary to traverse the metropolis. 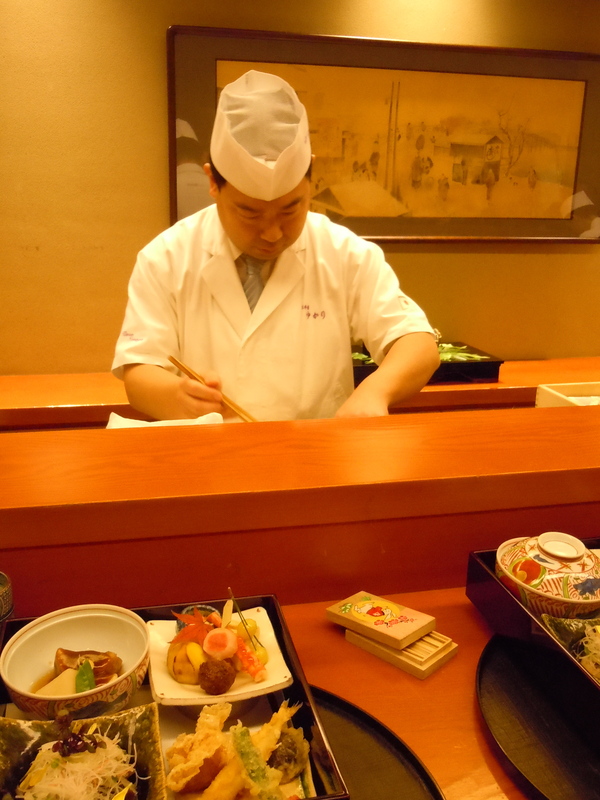 Sushi – Ginza Harutaka or Kyubey for high end. Both are in Ginza. 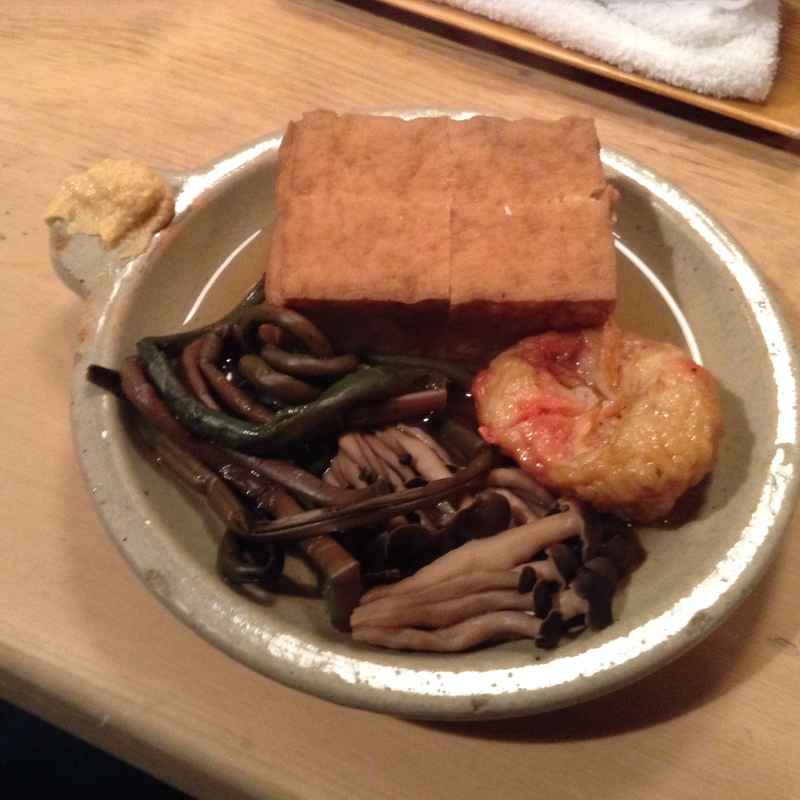 Tofu – Tofuya Ukai (Shiba Koen) – high-end and not exclusively vegetarian. Meat – New York Grill and Bar (Shinjuku). Exquisite views and service – a splurge. Alternatively Ukaitei teppanyaki (Ginza or Omotesando) – also upscale service, without the view of the New York Grill and Bar. I also love Dons de la Nature in Ginza as the chef cooks the wagyu in a kiln he built just for this purpose. The interior is stuck in the 70s but the steak is good. Just be sure to confirm the price of the steak before ordering as it is market price. 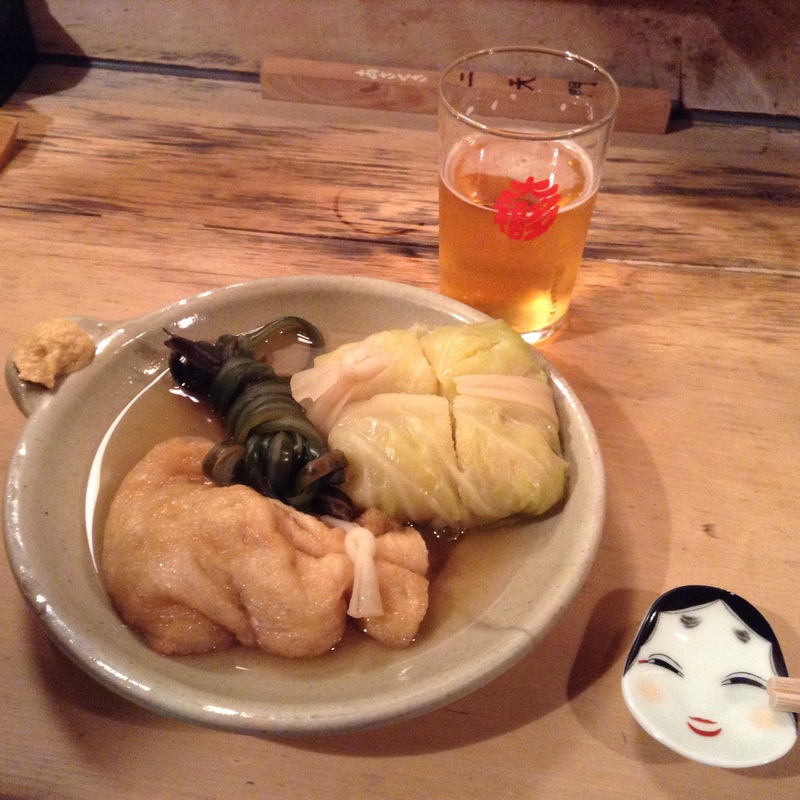 Izakaya – Yamariki (Morishita) or Saiseisakaba (Shinjuku or Monzennakacho). Kaiseki – Nihonbashi Yukari (Nihonbashi), Waketokuyama (Hiroo), Kikunoi (Akasaka). Note, I’ve been told that Nihonbashi Yukari no longer accepts reservations from non-Japanese. Not sure if this is true and will update this after I speak with the chef. Ramen – Ginza Kagari is my favorite at the moment. Afuri for the yuzu shio is also excellent. Alternatively, Ippudo (Ueno) or Kyushu Jangara (Nihonbashi or Harajuku). Note that Ginza Kagari in the link above has closed and is now at Ginza 6-4-12 and is now cashless (credit card, Suica, etc.). 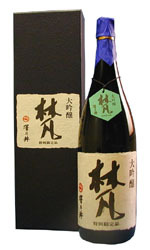 Monjayaki – Okame Hyottoko Ten (Tsukishima) or Sometaro (Asakusa). My short list of where to drink in Tokyo. A similar list of culinary highlights in Tokyo from Indagare. 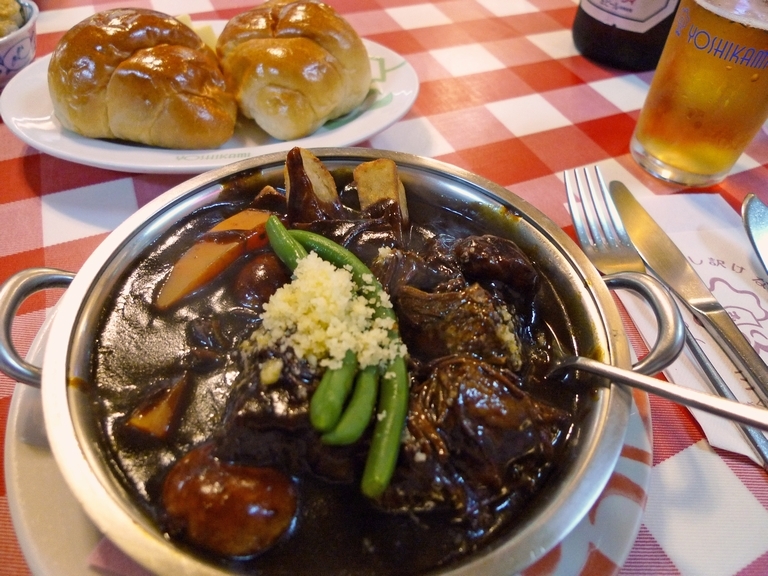 Yoshikami in Asakusa is famous for its beef stew. Tender beef in a demi-glace sauce. 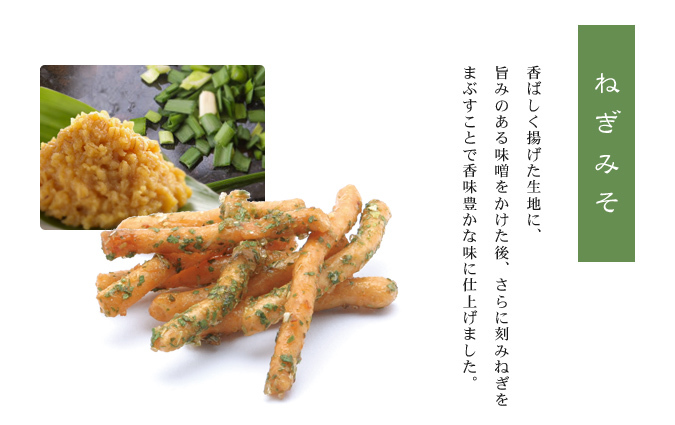 Other popular dishes include the omuraisu (omelet enveloping ketchup flavored rice) and croquettes. The feel of the restaurant is like a diner from the 50s in the USA. Be sure to get a seat at the counter where you can watch the food being cooked in the open kitchen. Yoshikami is a short walk from the temple Sensoji. 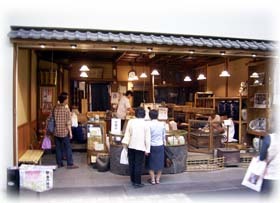 This shop to the left of the main gate is a popular destination for visitors. 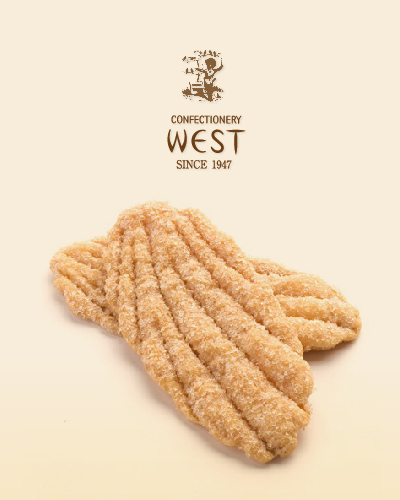 Okoshi are the popular food gift that Asakusa is famous for. These colorful, pastel-colored, puffed rice crackers include flavors like peanuts, almond, nori, mattcha, brown sugar, and black bean cocoa. 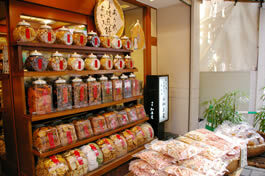 Tokwadou’s lineup includes a variety of crackers, sweets, and a unique collection of karintou crackers include flavors like Satsumaimo (sweet potato), wasabi, ninjin (carrots), tamanegi (onions), and pirikara gobo (spicy burdock root). There is a small production kitchen behind glass where you can watch the okoshi making process. This quaint sembei shop presents the rice crackers in glass jars with tin lids. A wide variety of flavors include both sweet and savory like shiso, zarame (rock sugar), and a very spicy dried red pepper covered ookara. The very delicate and thin usuyaki, nori wrapped, and an unusual type, an extra hard genkotsu. There is also a shop in the Nakamise Dori, but this selection is much bigger. 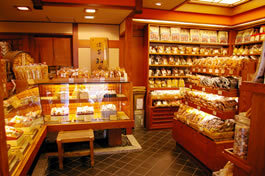 This popular shop is on the main street just to the right of the Kaminarimon has a collection of kawara sembei (crispy, tile-shaped sweet crackers), uzura kasutera (small bite-size castella cakes), ningyoyaki, and a mix of crackers called okonomiyose. Just off of the Nakamise Dori the corner shop is easy to recognize from the red paper umbrella and benches in front of the shop. Umezono in Asakusa, opened in 1854, has a strong following for anmitsu, oshiruko, soup-like sweets including azuki an paste, fruits, kanten and mochi dango. Their signature dish, awa zenzai, one of the most popular Asakusa sweets, warms up the body on cold days. 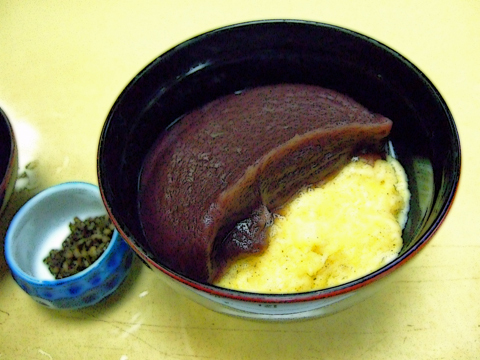 The awa (a small grain) is cooked slowly steamed until tender and presented in a lacquer bowl with some sweet azuki paste. 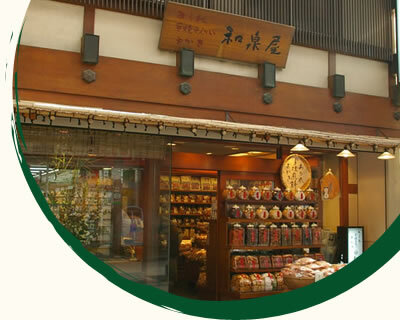 The menu has a full selection of traditional sweets to enjoy inside the café and several of their popular sweets are packaged to go like dorayaki, anmitsu, and mitsumame. Popular round sembei are toasted until a golden caramel color and then dipped into a soy sauce. Only one style is made, shoyu (soy sauce). 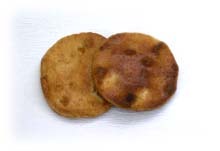 Uruchimai (rice) cakes are dried for 3 days and then grilled for five minutes. Each day they grill 4,000, winter takes longer to grill. Often the men are in white t-shirts and thin, white cotton pants. 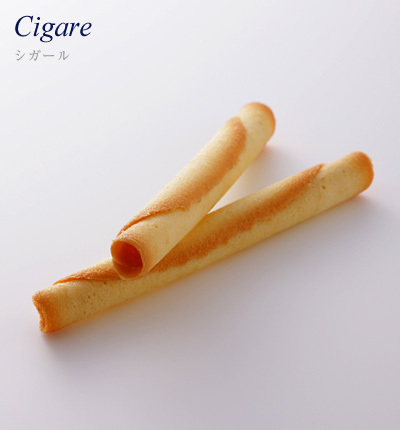 “Yakitate” osembei have just been toasted and are hot and the best way to try them. 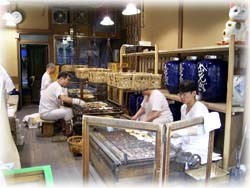 Iriya have been toasting rice crackers since 1914.